In the Zone: Tony Landrum keeps a stable of 20 Zs at the Z Zone on Pacific Avenue. 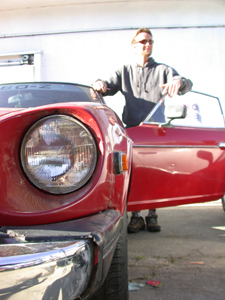 Just when you thought it couldn't get any better than the Mystery Spot, Santa Cruz now has the Z Zone: a zippy, zany and zesty new dimension where Z zealot Tony Landrum rents out his flock of circa 1970s Datsun Zs. Like other famous zones, the Z Zone exudes a powerful energy. The bright colors and sleek curves of the diminutive cars add a sparkle to the south end of Pacific Avenue near the Oceanview Cardroom and Saturn Café. The Z Zone is a celebration of one man's individuality and his joy in taking his hobbies to the next level. "Everything here is different," Tony says pleasantly as soon as I enter Z Zone headquarters, a cozy room furnished with a 240Z-era brown and yellow sofa, purple shag carpeting and an assortment of ancient-Egyptian-inspired art on the walls. Outside, about 15 of the Zs are congregated in a small parking lot. Tony has about 20 Zs total in his collection. Besides the cars for rent, another four are on loan to friends, and Tony's oldest Z, a gold five-speed 1970 240Z that he is continually customizing, is kept off the premises. "It's hard to keep up with them all," he says. Tony got his first Z in 1978, shortly after completing college. "It was so tight," he says. "It was so great for commuting. I said, 'Damn, this is me.' Then I wound up with another one, and another one, and another one." The Z collection grew into a business, a diversion from his main occupation as a therapist. Tony has his master's degree in counseling and has run abuse recovery centers all over the state. The charismatic and compassionate 53-year-old San Francisco native has long been one of the Bay Area's leading drug addiction treatment therapists, championing holistic treatments for addiction including acupuncture, massage and vitamins, and teaching clients how to love and accept themselves. "It's all about being yourself," says Tony, reclining on the sofa in sweats and a ski cap. "I'm myself. I'm not trying to be anybody. I'm not trying to impress anybody." Tony first opened the Z Zone in Berkeley in 2002 and ran the business for a year there until he had problems with his insurance. He was able to get more affordable rates having the business in Santa Cruz. The cars rent for $28 daily, $250 weekly or $950 monthly, plus $12 per day insurance, for up to 100 miles per day. After the first 100 miles each day, there is a $5 charge per additional mile. Tony intends the cars to be used for local excursions. 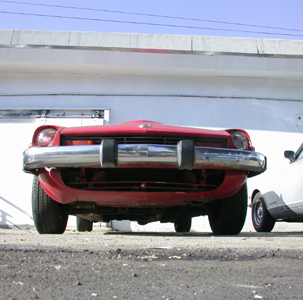 What many consider to be the zenith of sports cars in its time, the Datsun 240Z was first released in 1970. Featuring a peppy V-6 engine, tight steering, vinyl seats and a sporty, classy design, the 240Z was clearly a car built not for pampering, but for fun. Priced at around $3,500, it was a tremendous success that outran all its competition (Tony says they now sell for about $7,500). The 260Z was released in '74 with the engine enlarged to 2.6 liters. Although horsepower was increased, weight was also increased and performance was not improved. A four-seater model was added to the line the same year. The 260Z was built for only one year before it was replaced by the 280Z in 1975. The 2.8-liter 280Z benefited from fuel injection, improving performance enough to surpass 240Z levels. The 280Z was followed in 1978 by the toned-down 280ZX, which looked well and sold well but was not as powerful. With the release of this model, Datsun renamed the cars Nissan. Z purists like Tony say that the glory days were over by '84, when Nissan cranked up the price and added lots more gizmos with the release of the 300ZX, getting further away from its elemental sports-car roots. It had a difficult time competing with the American-made and similarly priced Corvette. Nissan quit making the car entirely in '96, up until 2003 when it released the 350Z. Tony's not very excited about the latest model. "It's like making a cake from scratch vs. making cake from a box," he says in explaining the difference between the new Zs and the old ones. Wheels of Fortune: Three decades ago, Zs were the height of car cool. Resisting the pearlescent lavender and cherry red Zs was difficult, but I finally selected a white 1971 240Z to take out for a whirl. Renters will quickly discover that Tony's fleet is not exactly in mint condition. There are cracks in the vinyl, cigarette butts in the center console, nonworking radios and other character-building issues you might expect from 30-year-old cars. I couldn't have cared less. Careful to mind the 100-mile limit, I decided to zoom up to Davenport and then through Bonny Doon. Soon I was on Highway 1 in with the wind whipping through my hair and a huge grin plastered to my face. In my entire car career, I have never been in a car that goes 70 mph in fourth gear with such low RPMs. It may not be Starsky's Gran Torino, but it was pretty bitchen. And I sure was looking cool. The car was surprisingly quiet and smooth, too. The experience was at times like roller skating and other times like flying a jet. The rack-and-pinion steering took a bit of getting used to, but after a while I came to see it as I would a good dance partner: one who leads you and gives you weight. The car did have a problem with an exhaust smell leaking into the front seat. Tony said this is a notorious problem with Zs, due to the door not sealing properly on the hatchback, and he is working on fixing it on all his cars. He has done the majority of the work restoring all the cars. "The key to running a successful Z car business is having parts," says Tony, as he rummaged through a large sack brimming with extra seat belts. The Z Zone also sells Z parts. In a world of SUVs and increasingly tanklike, spaceshiplike vehicles, the little old Z is still holding its own. For those who lived the Z era, it also has some nostalgic value, too, of course. "Why don't you leave the kids at home, pick up your wife, and come and rent a two-seater," says Tony in a call-out to former Z troopers, "and enjoy yourself like you used to?" From the March 24-31, 2004 issue of Metro Santa Cruz.